Housing Hope’s Twin Lakes Landing project in Marysville, Washington, has won an award for the Affordable Housing category in the 2018 Best in American Living™ Awards (BALA) by the National Association of Home Builders (NAHB). Award levels, including platinum, gold, silver and Home of the Year, will be announced during the NAHB International Builders’ Show on February 20, 2019. The major design and planning objectives were to create a sense of community by providing moments where residents can interact. In a few words, to really bring together a community that can thrive and grow. 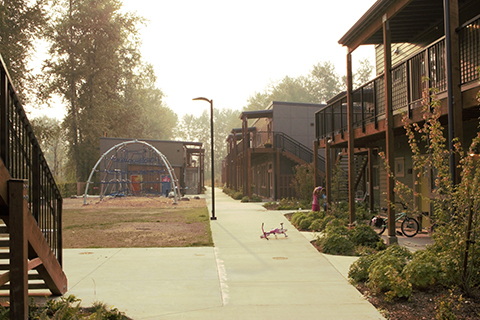 This modular project built on the shores of Twin Lakes in Marysville, is home to 50 families who were previously homeless. Designed for Housing Hope, the team of Designs Northwest/HKP Architects created a new community for families to enjoy their own permanent housing and take advantage of Housing Hope’s educational and childcare programs. The site includes a community garden, children’s play area, interior courtyards and lawn space. Views of the water are emphasized in the communal areas as well as the southern facing units. Built to Evergreen Sustainable Design Standards, this project is energy efficient and utilizes sustainable materials throughout. The project consists of six, two-story buildings on a 2.5-acre site overlooking the serene Gissberg Twin Lakes, which is a County Park with walking trails. Modular construction was used to gain economic efficiencies and reduce the construction time line. Residents enjoy views of the lake from south facing apartments and the two open spaces designed for children’s play and quiet contemplation. There are sixteen one-bedroom units and thirty-four two-bedroom units for a total of 42,100 square feet. “This project represents so much about why we do the work we do – building relationships, working to solve problems, and adding something positive to our communities. We are grateful for the opportunity to work with Housing Hope to further their mission and impact,” said Julie Blazek, Partner at HKP Architects. Now in its 35th year, BALA recognizes outstanding achievement by builders and design professionals in all sectors of the residential housing industry including single-family production, custom, multifamily, affordable, remodeling, community and interiors. BALA is built on the principle that all great projects start with great design, no matter cost or size.